If you love nocturne paintings but don't know where to start, then this book is for you. Filled with inspirational examples by the masters of nightime painting, this little book is sure to fire up your creative energies. Never tried painting at night? We show you how it's done with a step-by-step-oil demo and a tale of night painting in the wilds of Rocky Mountain National Park. The Primer on Night Painting - Nocturnes is a 7 x 7" PDF download with 40 pages of text and images. It includes a gallery of paintings by masters of the nocturne, information to inspire and encourage you in your plein air nocturne painting, an illustrated step-by-step demo and tips for working in pastel and oil. An Artist's Road Exclusive! Shortly after ordering a downloadable book, you will receive an email with a link that allows you to download the book to your device. 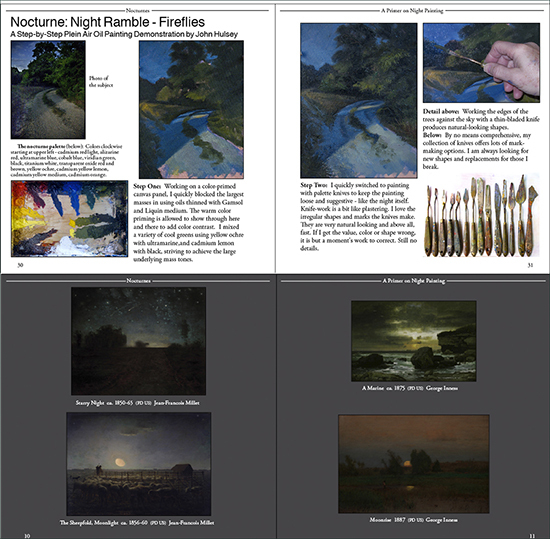 Click the button below to add the Nocturnes - A Primer on Night Painting downloadable pdf to your wish list.